First Focus’s signature publication series offer a unique perspective on children’s policy, reaching across “issue” silos to illuminate the bigger, broader challenges facing children and the potential of federal policy to improve children’s lives. For hardcopies of signature publications or with questions, contact us. 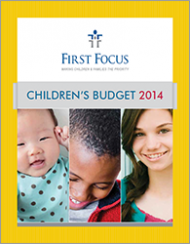 The federal government makes more than 180 distinct investments in children. These include traditional “children’s” initiatives, like education and child abuse and neglect prevention. They also include other investments that improve the lives of kids, like Medicaid and the Supplemental Nutrition Assistance Program (formerly Food Stamps). Data is updated annually, reflecting changes to congressional appropriations, automatic changes in spending for “mandatory” federal programs, and proposed funding and new initiatives in the president’s budget. Our Children’s Budget series offers a detailed guide to federal spending on children and an invaluable resource for those seeking to improve the lives of America’s youth. Children face real challenges on a wide range of issues, from education to immigration and health to housing. 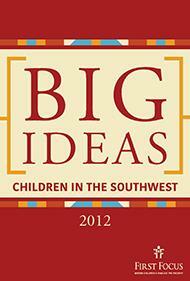 Making progress requires smart, creative ideas across the entire spectrum of challenges facing kids. Our biennial Big Ideas series challenges leading minds to think boldly, offering game-changing ideas to address the most pressing problems of our time and improve the lives of children. 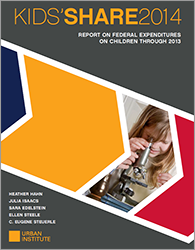 Today, federal investments in children account for just a few pennies on the dollar. But it wasn’t always that way. Our Kids’ Share publication series looks at how we got here and where America is going, unless Congress reinvests in kids. Kids’ Share’s comprehensive lens looks at all aspects of the federal budget, including tax policy, as well as “mandatory” and “discretionary” budget items. Solving the problems children face begins with understanding them, and Kids’ Share offers a complete picture of children in the federal budget.